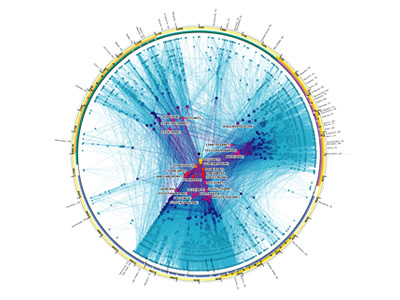 This graph reflects 1,134,634 IP addresses and 2,434,073 IP links (immediately adjacent addresses in a traceroute-like path) of topology data gathered from 25 monitors probing approximately 865,000 destinations spread across 76,000 (62% of the total) globally routable network prefixes. 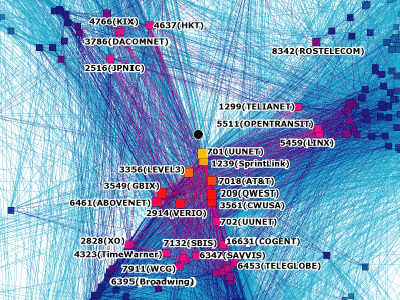 "We then aggregate this view of the network into a topology of Autonomous Systems (ASes), each of which approximately maps to an Internet Service Provider (ISP) (Some ISPs administer more than one AS but it is not typical). We map each IP address to the AS responsible for routing it, i.e., the origin (end-of-path) AS for the best match IP prefix of this address in Border Gateway Protocol (BGP) routing tables collected by the University of Oregon's RouteViews project. The abstracted graph consists of 12,517 Autonomous System (AS) nodes and 35,334 peering sessions. The resulting graph contains 11,411 AS (73% of all ASes present in RouteViews BGP tables on 8 May 2003) and 32,209 peering sessions."